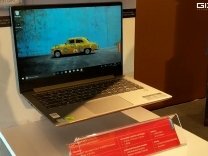 The Lenovo Z51 80K600W0IN runs on Windows 10 Home Edition. The laptop features a 15.6,Full HD WLED Backlit Anti Glare IPS Wide View Glossy Type Touch Display and is powered by a Intel Core i5,2.3 GHz with Turbo Boost Upto 2.8 GHz processor. To enhance multi-tasking and fast speed, the company has offered a 4 GB DDR4 RAM.